Discussion in 'VT - VX Holden Commodore (1997 - 2002)' started by mpower, Oct 28, 2013. Small Q guys, my Clubsport has a bit of noise around the tensioner area which I'm almost certain is the tensioner pulley. Can I swap one out from another car without adjusting anything to check to see if that's it or is there some sort of adjustment required? Also is a noisy tensioner something I need to rectify immediately or can I safely wait until the weekend. Can't see why you cant swap it out. After all it is the adjustment for the belt tension. And it depends how bad it is. If the bearing seizes (as it did in an old Tarago I had) it will smoke the belt and break it. Don't get one from a corolla, or a falcon, or a pulsar, or a rio but if the other car is an LS1, **** yeah! Belt off, swap, belt on, go! If it ceases it will snap the belt and you'll get all sorts of warning lights plus loss of power steering, if it snaps, stop driving, the water pump is not pumping any more. Either change pulley only or pulley and the arm that holds the pulley. Pulley might be left hand thread, whatever way it spins normally will be tightening so to undo opposite. Thanks guys might just drive the Monaro for the rest of the week and swap them over on Saturday, just checking to see if there was anything special. All sounds very simple though. Ratchet to the right to release tension on belt, undo belt, then ratchet to the left and undo the pulley nut. Think the pulley is round $20 if wanting to go Nuline new. However, if that one is going, then the others might be on the way out also as i found out. However again, i regreased mine. So easy to do man. Only one that cant be regreased is the main engine pulley as total sealed unit. as always super helpful info, thanks uni - I was actually considering repacking the remaining ones as a preventative measure but I'd say you are right probably worth doing the lot altogether. Where did you source the Nuline ones? Nuline from Ripco, but ebay and Ozie (closeish to me but can deliver) but were fairly cheap actually. I noticed that don't think I'll bother doing them all. I am currently doing the pullies as well on my vx berlina 5.7l as well. The tensioner was making noise replaced the pullie only to realise the water pump itself is making a horrible to noise so I have to replace that to and while I am at it may as well do the other pullies and belts while its off most are a bit wobbly and don’t sound nice when rolled. I have taken off 3 of the pullies including the water pump tensioner and idler, and the air con tensioner, but on the air con idler pulley is a weird star pattern bolt. I have a star kit the only description is number 50 is fitting but the bolt is impossible to loosen, I have broken a 1/4 inch drive fitting so far on it so far. I used kincrome security torx set and some crappy half inch ratchet with ring spanner on the end for leverage..
With lots checking, boys in America forums said to soak with silicon etc and apply tools and use building steady pressure very slowly. Thought I'd report back on what I decided to end up doing, simply removed the belt, gave it a spin thought that sounds dry but there's not really any play so removed and repacked with some bearing grease and she's now good as new - total time 20-30 minutes to remove and clean and repack and 5 to refit. That and $10 for the grease. another update - holy mother of! I went back to have a look at the other pulleys just out of curiosity and they were all dry as anything. For the few minutes this takes I thoroughly recommend doing it to anyone. Also sweet jeebus that T50 Torx, I cannot for the life of me undo mine!!!! Basically heres what i used. Top is the new torque wrench, wish i had it at the time. 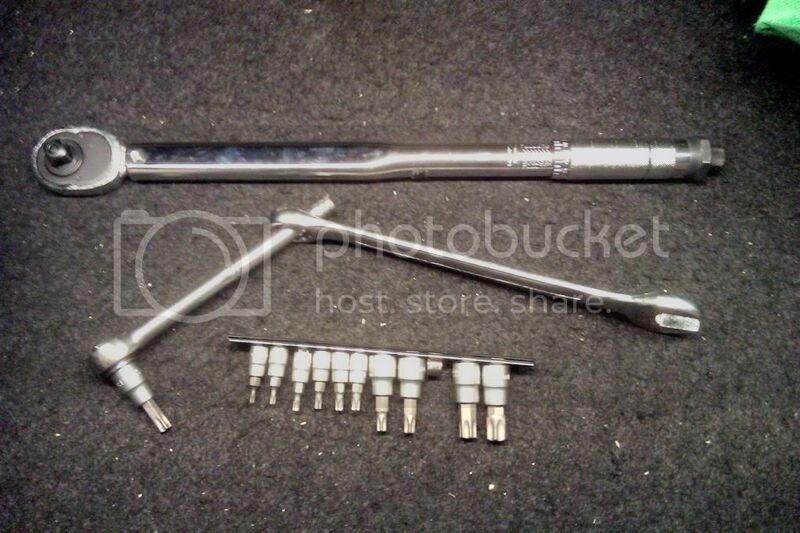 But below is how i did it, torx T50 Kincrome, some ratchet and ring spanner for leverage. I used left hand and guided the torx bit and sat it firmly in the torx bolt and slowly added torque pressure to the ratchet thingy.